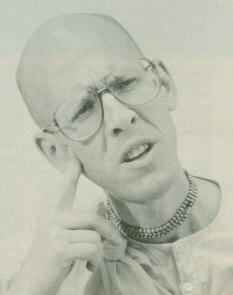 Jayadvaita Swami finds himself as the main character in one of most controversial dramas in ISKCON, namely the posthumous editing of Prabhupada’s books. Taking these instructions into consideration, the question arises:”Why is Jayadvaita Swami still deeply involved in this controversy?” He is actively debating the issue, writing articles, making videos, giving seminars and continuing his work of re-writing Srila Prabhupada’s Bhagavad-gita As It Is. This entry was posted in All posts, BBTI, Debate, Direct quotes, Jayadvaita Swami, No authorization, Prabhupada said and tagged authorization, bbt, BBTI, controversy, Jayadvaita, posthumous editing, prabhupada. Bookmark the permalink. The instruction quoted above from the April 10, 1976 morning walk, to avoid controversy, was advice given directly to Jayadvaita Swami by Srila Prabhupada. He also said on that occasion that if something is controversial, “do not print it.” According to the principle of arsa prayoga, this instruction should have been applied to all of the proposed changes to Srila Prabhupada’s books which were made without his approval.